Lonely? Want someone to talk to? 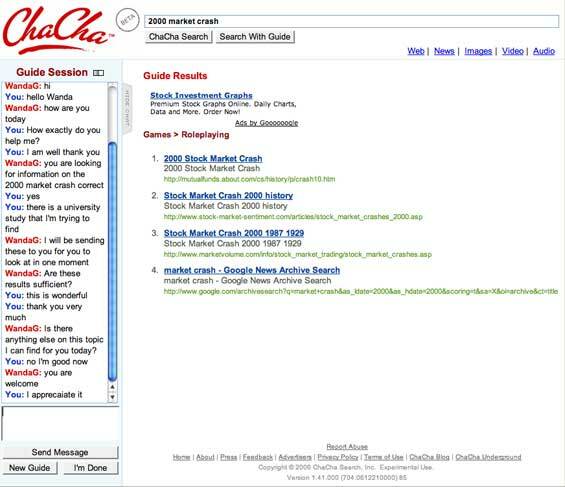 Go to ChaCha, a new search engine, and talk to a guide real time about your search. As long as you remain somewhat on topic, I’ve found that the guide will talk to you as long as you like. There are two ways to search on ChaCha . They have a more traditional search engine that has good but not deep results. But the cool service is guide driven, via an instant message screen on the page. While I found that the results were not nearly as good as Google, it is a lot of fun to talk to the guides. The company, which is based in Indianapolis, announced a $6 million round of financing today that included an investment by Jeff Bezos through his Bezos Expeditions fund (the same fund that invested in 37 Signals). This is a perfect fit for Amazon’s Mechanical Turk product, and I expect the company will be using that service at some point for the search guides. While it isn’t clear to me how the company can make money inserting human labor into the search process, they now have at least $6 million to burn while trying. If you’d like to be a ChaCha guide, you can apply here. As an aside, ChaCha has a linking policy that forbids linking to any page other than the home page. I’m not sure what misguided lawyer told them to do this, but I’ve blatantly violated that policy in this post, including by linking to the policy. Note to ChaCha – links aren’t bad and this policy isn’t enforceable. Update: Here’s a post from Michael Wales, one of the ChaCha guides.